If you’ve seen Traffic, Crash, Babel or American Gun, then you’re already familiar with the new genre of ensemble drama which examines a social issue from a variety of perspectives, interweaving an array of partially-overlapping plotlines as a cinematic device. 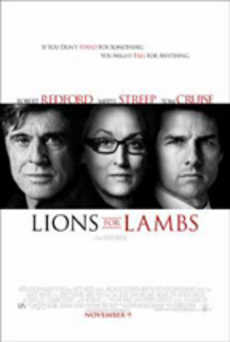 Perhaps the least successful of these endeavors is Lions for Lambs, an unabashedly anti-Bush polemic directed by Robert Redford. Despite its dizzying cuts back-and-forth from scene to scene designed to suggest a meta-portrait cobbled from a juxtaposition of opposing opinions, the truth is that the three parallel stories told here are essentially all advancing the same point-of-view. And rather than allow the audience to draw its own conclusions, this preachy picture hits you over the head repeatedly with talking points lifted right out of the liberal playbook. Even if you agree with that premise, you are unlikely to enjoy the ham-fisted fashion in which Lions for Lambs forces it down your throat, invariably telling you how to feel at every turn instead of painting tableaus which elicit the desired emotional response. Redford himself stars in one leg of the triskelion, as pontificating Professor Stephen Malley, a Vietnam vet who prods his pupils to make the most of their lives by prattling-on in poster-speak like “Don’t live over a safety net!” Apparently, something in the sermonizing resonated with a couple of his former students, one black, Arian Finch (Derek Luke), and one Latino, Ernest Rodriguez (Michael Pena). Through the magic of disconcerting flashbacks we learn that they had only been able to afford to attend the California college/country club because they were tokens allowed in on scholarship as gifted student athletes. Before shipping out to the Middle East, they credited Malley with having inspired them to enlist to serve on the front lines in Afghanistan. This unintended consequence distresses Malley to no end, since he sees them as naive idealists being exploited by an immoral administration waging an unprovoked war of aggression. Meanwhile, his classroom still remains filled with lazy white guys like Todd (Andrew Garfield), a party animal who could care less about academics. Not easily discouraged, Malley takes a special interest in this rudderless smart aleck, and lets him know just how spoiled rotten he is during heart-to-hearts talks behind closed doors. The second scenario conveniently dovetails with the first, as it involves the prickly predicament Arian and Ernest land in when their helicopter is ambushed by the Taliban while on a mission over some snow-capped mountains. After Ernest is wounded and tumbles helplessly into the darkened sky, Arian instinctively jumps out to save his pal even though neither is wearing a parachute. With the crippled copter limping back to the base, they’re soon surrounded by the enemy, but fortunately afforded a few opportunities to wax philosophical before their Butch Cassidy and Sundance Kid sayonara. If only exposing corruption were as easy as reciting the right song to a culprit. A simplistic, if well-intentioned, overindulgence in obviousms.